Unpaid traffic (we colloquially refer to all unpaid traffic as organic) is the good stuff. This traffic comes directly to the site through three main avenues: direct (physical typing of the we address), referral (links from other websites), and organic (unpaid search, such as a Google search result). The impressions resulting from unpaid sources can usually be counted on to provide recurring visits, and are therefore good for long-term, sustained, consistent performance of the website. Paid traffic, which is known as arbitrage, refers to the practice of buying traffic for a given website. 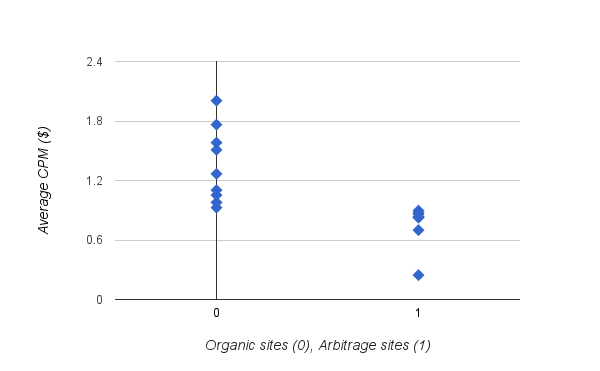 The objective of arbitrage is to make more money from the traffic landing on the page than it cost to buy that traffic in the first place. If it cost $0.001 to buy a given impression, and that impression is worth $0.002 on the page, the arbitrage model works. Arbitrage has some rather large downsides. The impressions received from paid traffic tend to be low-quality and transient, which then correspond to lower CPMs (cost per thousand [mille] impressions). Arbitrage can also result in higher amounts of fraudulent traffic. Fraudulent traffic, if detected, can result in a refund to the advertisers for the money spent on fraudulent traffic, for which the publisher, who sold that traffic, would be held accountable. Not only does arbitrage provide lower CPMs than unpaid traffic, it carries the very real risk of exposing publishers to fraudulent traffic. Publishers using the least amount of paid traffic enjoy the highest CPMs. Buying traffic can be an easy way to get quick and easy impressions, but it is the unpaid page views that are rewarded by advertisers. Organic traffic is the main ingredient needed for creating a more profitable web property and building a sustainable online business for publishers. Don't miss another article from the Sortable team.